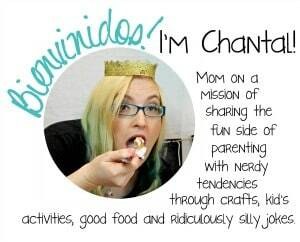 Do you have a boy or girl completely obsessed with Star Wars? 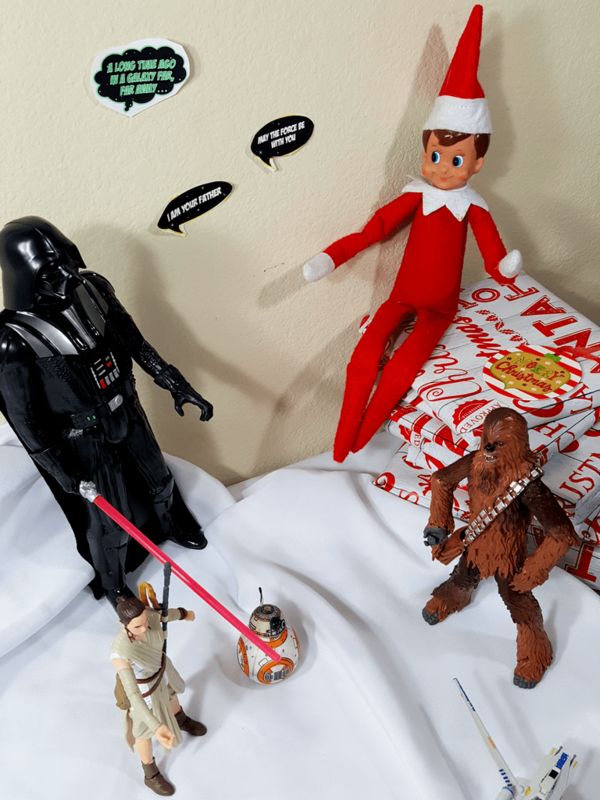 We have a few ways that you can Elf On The Shelf Star Wars Style that your kids are totally going to LOVE! 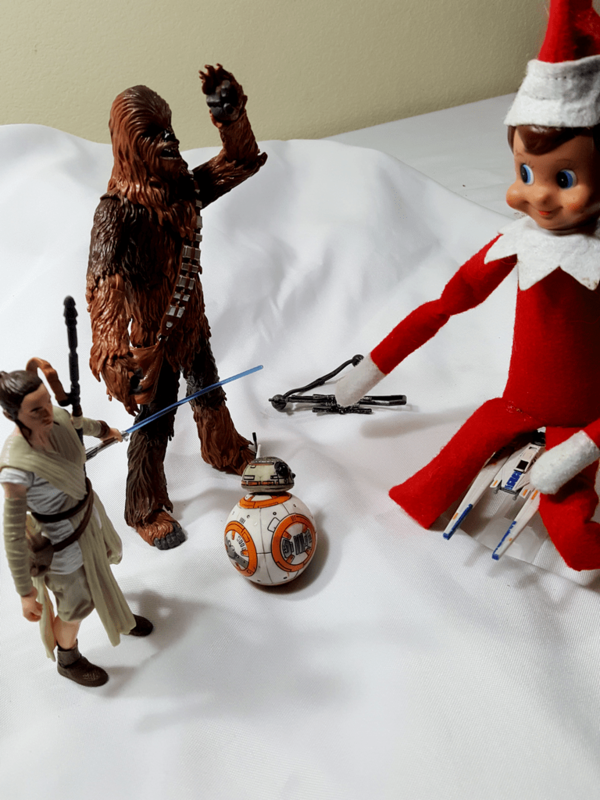 They will get a kick out their elf’s Star Wars antics. 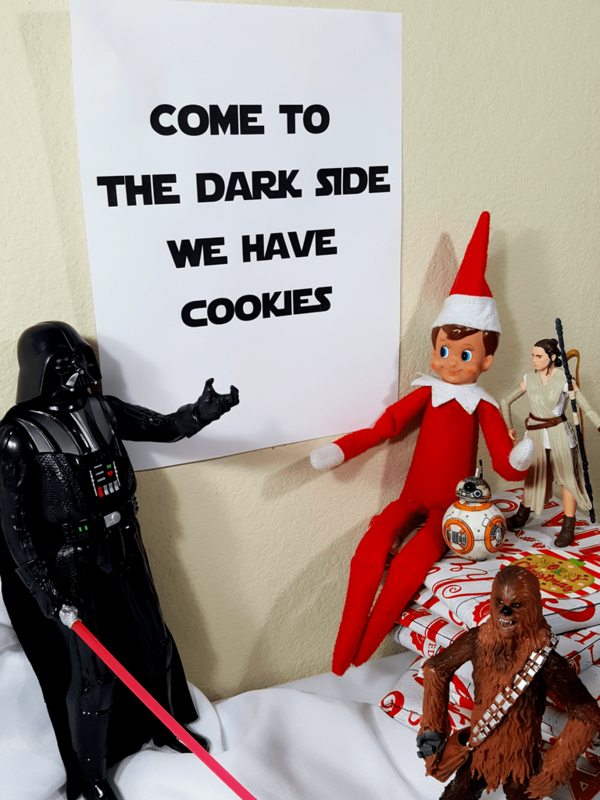 Darth Vader, Rey, BB-8, and Chewbacca along with a sign that says “come to the dark side, we have cookies”. Because we all know that inner you wants to be on the dark side. 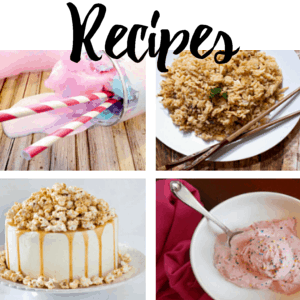 Just add a plate of cookies for more fun! 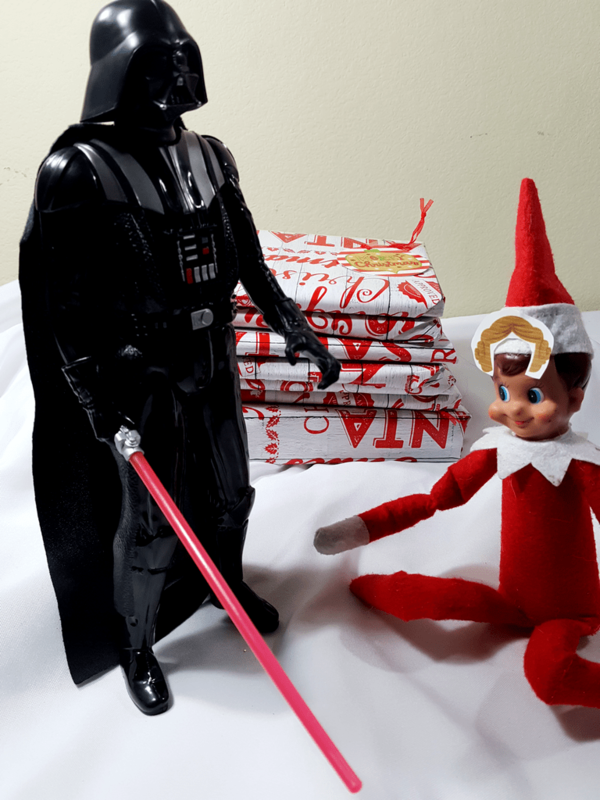 Vader Using The Force on the elf. It’s Vader and he’s the FATHER! Running with Rey and BB-8 on Jakku. 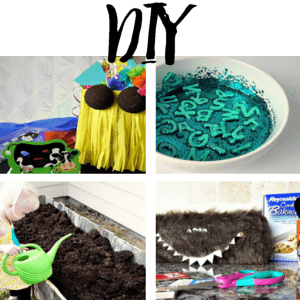 Use some brown sugar for sand! Uh Oh! Looks like Chewbacca is angry. What did the elf do to his weapon! 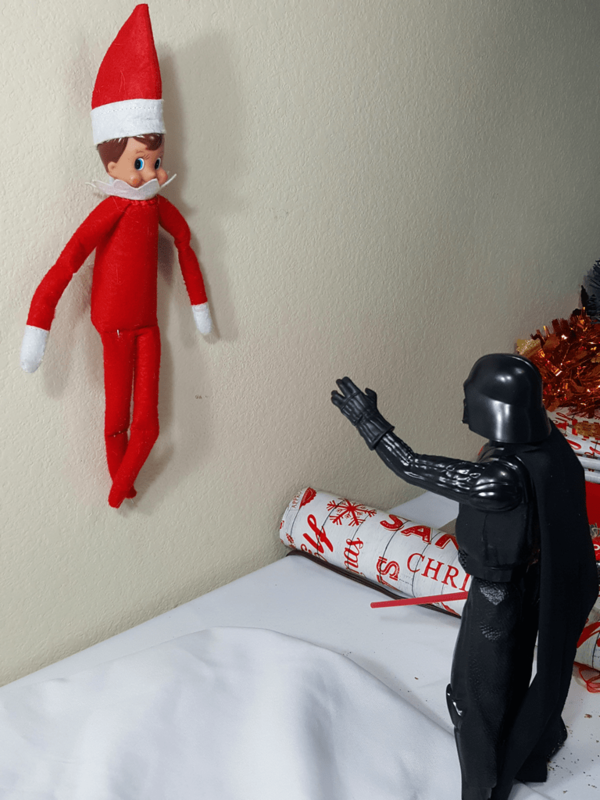 It looks like the Elf on the Shelf is trying to hang on an fly again. Oops! They ran into the tree. Master Yoda is that you? No, that’s just the elf in a mask. Just print Yoda face and use tape to attach. 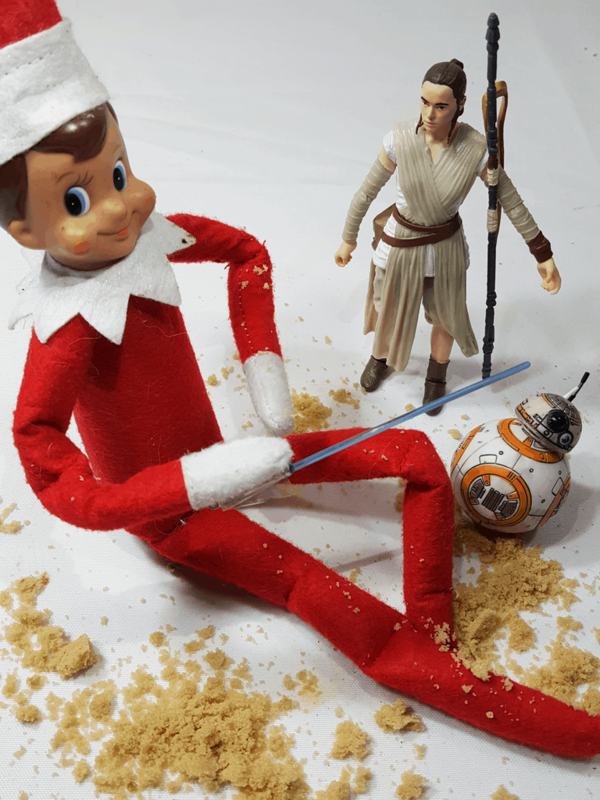 That mischievous little elf. He’s trying to pull one over on Vader. Do you really think he will know that’s not Leia. 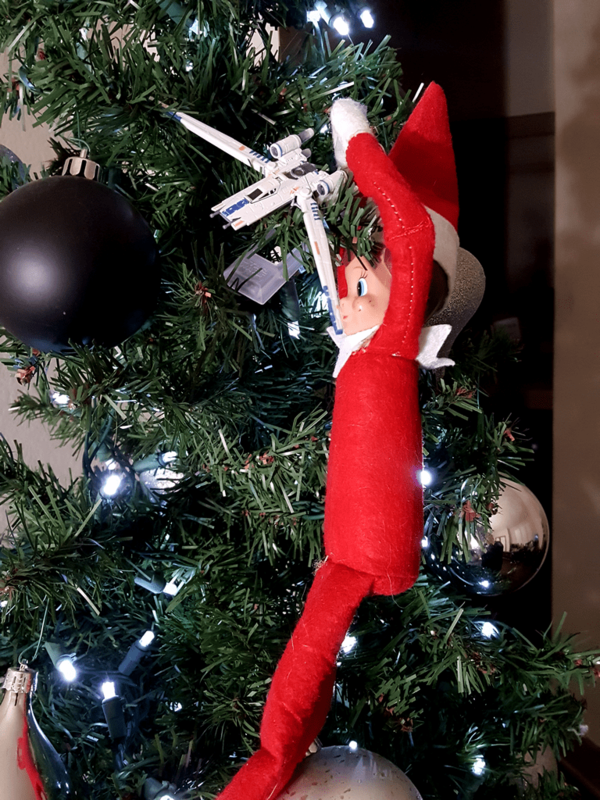 Oh that Elf on the Shelf are you really trying to ride that Rebel U-wing Fighter again! Chewbacca is saying you can’t be on that. 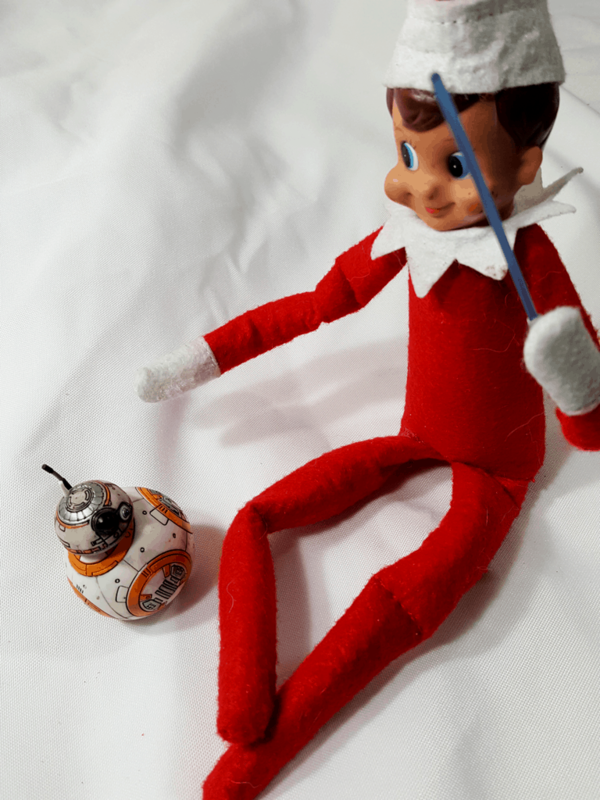 BB-8 is wondering is the Elf suppose to have that saber. Hmm…. 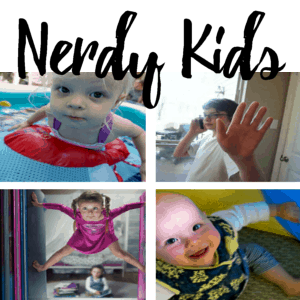 A little fun with the entire gang. Looks like they found the presents. 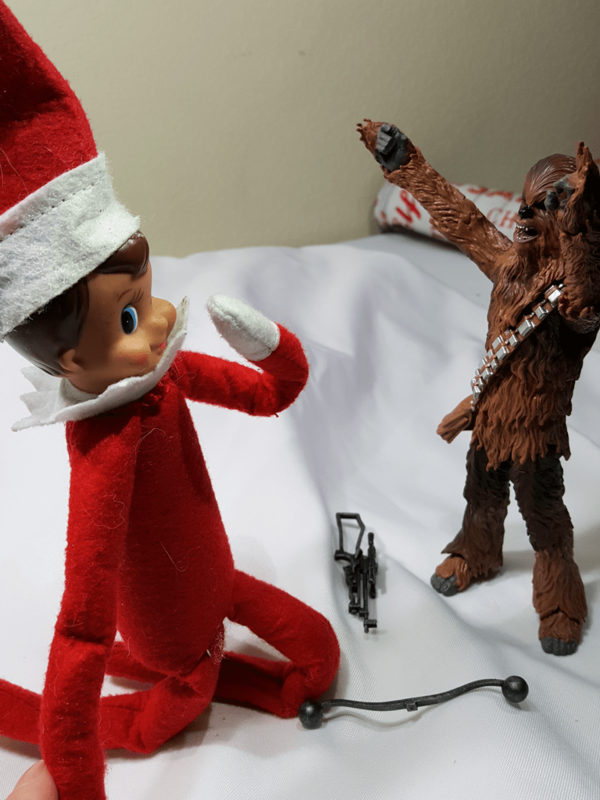 Dueling with a storm trooper with the elf. 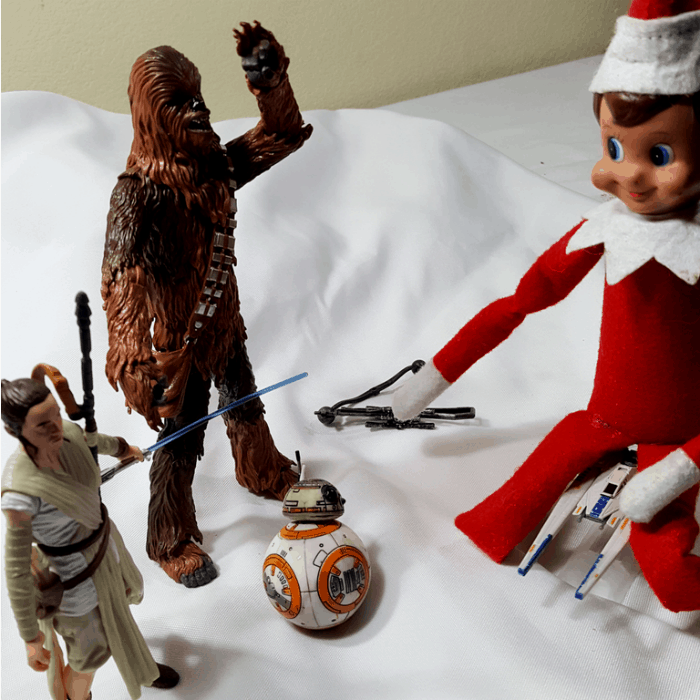 Of course, we know the elf isn’t going to win. A little Jedi robe from a washrag and a piece of string and you can turn your elf into the perfect Jedi. Printed Jabba-the-Hut taped to him, with a face cutout. A jet-pack from toilet paper rolls. C3P0 with foil and foil red arm. 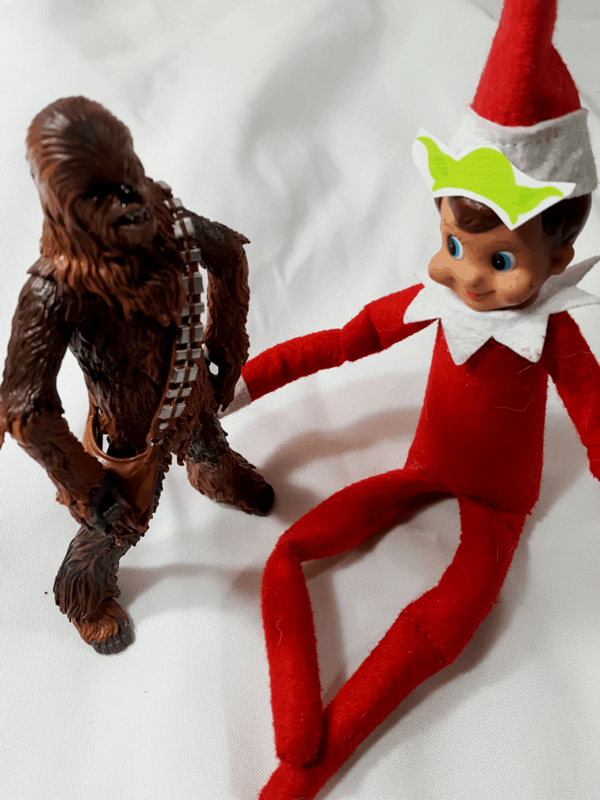 Wrap in brown fake fur with a black bandoleer like Chewbacca. Big floppy green ears like Yoda! 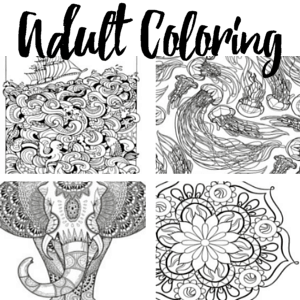 Oh, and make sure you pin this post so you can come back all season long!